For the last week of heART of Huntsville, we gathered at one of the oldest homes in Huntsville: The Kellogg-Pritchett Home. Ms. Mary Laura Gibbs, the owner and renovator of the home, greeted us to provide a historical overview of the Huntsville landmark. The Kellogg-Pritchett House was built around 1890 by a Sam Houston mathematics professor, Joseph Lucien Pritchett and his wife Lenora. In its entire history–almost 130 years–it has only been lived in by two families: the Pritchetts and the Kelloggs. The Pritchetts lived in the home from 1890-1945, and the Kellogg family owned it from 1945 until William Kellogg’s death in 2004. 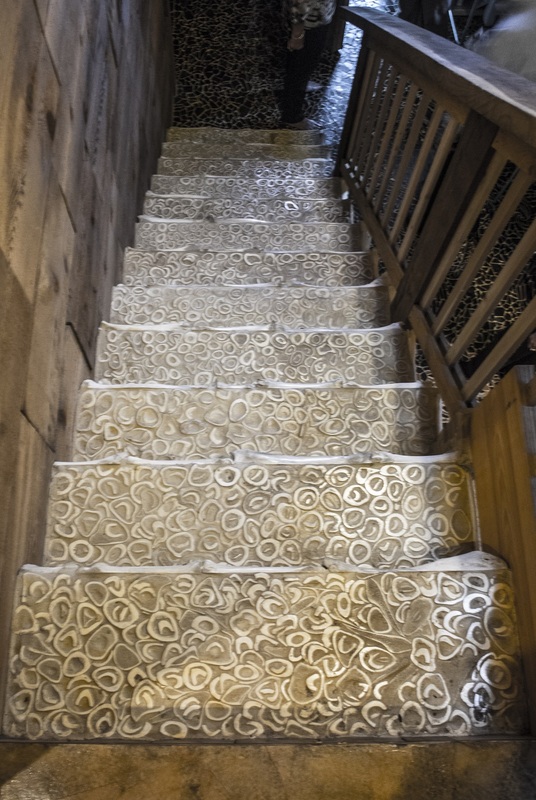 In 2006, Ms. Gibbs bought the home to renovate and preserve its Victorian folk-art design. The house is not in its original form. The walls of the main entrance were once covered in layers of wallpaper, but now they have been updated with a rich teal color – a staple of a Victorian home. The house also inhabits a water painting by Kate Pritchett which illustrated what the Pritchett farm looked like when it was first constructed. 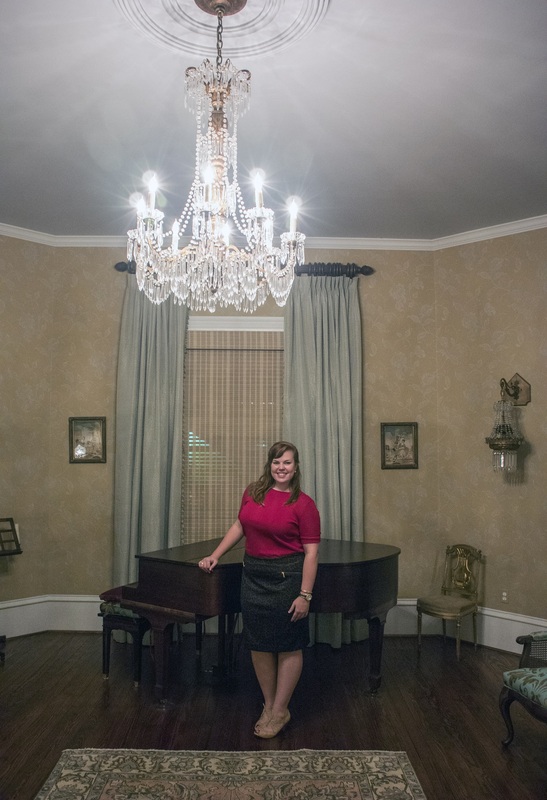 Additionally, Ms. Gibbs discovered the original rolling doors that partitioned the main entrance from the front parlor – a room which was used to host many parties. In the next room, we found windows that extended from the floor all the way up the wall. Before air conditioning was invented, these windows were used to cool the house during the sweltering Texas summers, and it allowed the kids to roam and play outside. The fireplace also resides in the living room and is is lined in what looks like bathroom tiles, however each tile had a painting in blue paint that referenced a Biblical story. In the next room, we discovered a Lee Jamison makeover. When you walk into the room, the mural gives the illusion that you are standing under a gazebo. …and was enhanced by the artist’s presence during the tour. From there, we filed into the kitchen which was painted in a vibrant red and yellow. This color scheme was very popular in European countries during the Victorian era. 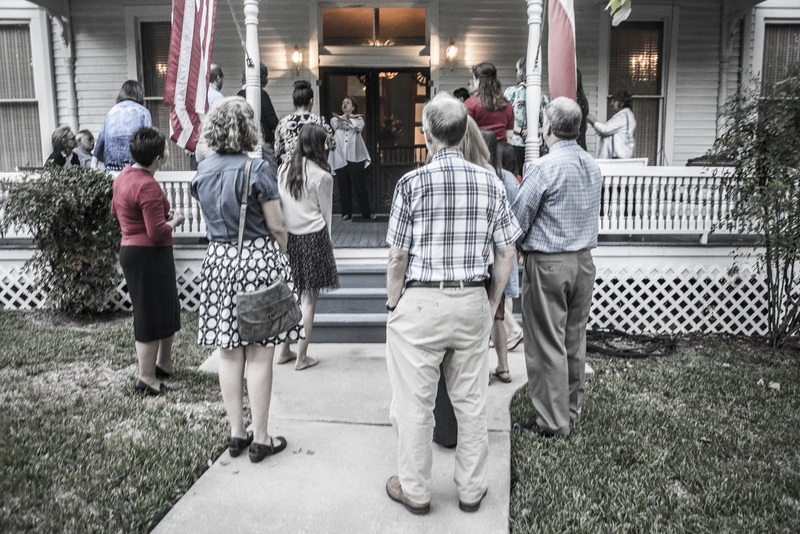 Next, we were shown an addition to the house that served as a school house for the children. Previously, this addition to the house was utilized as a Presbyterian church and later a barn. This concluded our wonderful tour of the Kellogg-Pritchett Home. After thanking Ms. Gibbs for the tour, everyone made their way to the Wynne Home to settle our rising appetites. When we arrived at the Wynne Home, we were teased by the pleasant smell of dinner. While patiently waiting our meals to be served, we enjoyed the Día de Los Muertos decorations and the tours given by Professor Yawn. Afterwards, everyone gathered in the gallery and took an unexpected quiz to measure how much they learned over the course of the four weeks. Shortly after finishing our quizzes, Lee Jamison offered to give a brief overview of his F.M. 405 Exhibit. He explained that he wanted to capture the beauty of east Texas because we often fail to recognize and give reverence to the beauty that surrounds us. To conclude our night, and sadly heART of Huntsville, we enjoyed a lovely dinner prepared by Ms. Chasteen – A Friend of the Wynne – and left the Wynne Home with a deep appreciation for art, history, and Huntsville. 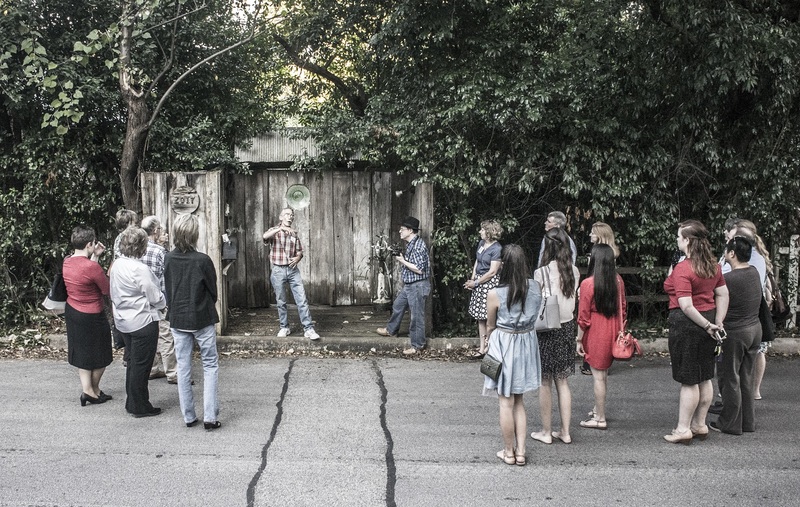 With the fourth week of heART of Huntsville came a focus on architecture with, of course, a healthy dose of art. 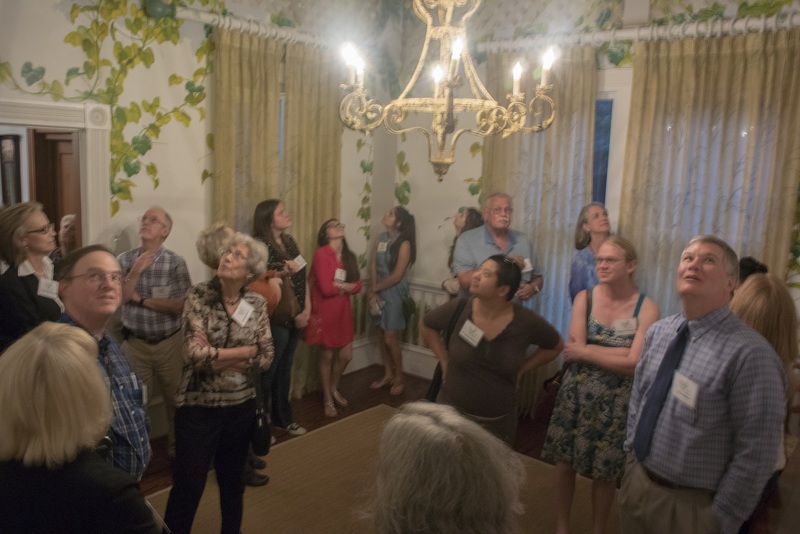 After weeks focusing on campus art, outdoor sculptures, David Adickes, performing arts, and Richard Haas, the final week of the program focused on three homes in the Huntsville Cultural District: The “Bone Home,” the Kellogg-Pritchett House, and the Wynne Home. Part of what made the final week special was that Anina Moore, the Director of Communications for the Texas Commission on the Arts, traveled to Huntsville to observe the program. This was her first real visit to Huntsville, and we hope she enjoyed it! 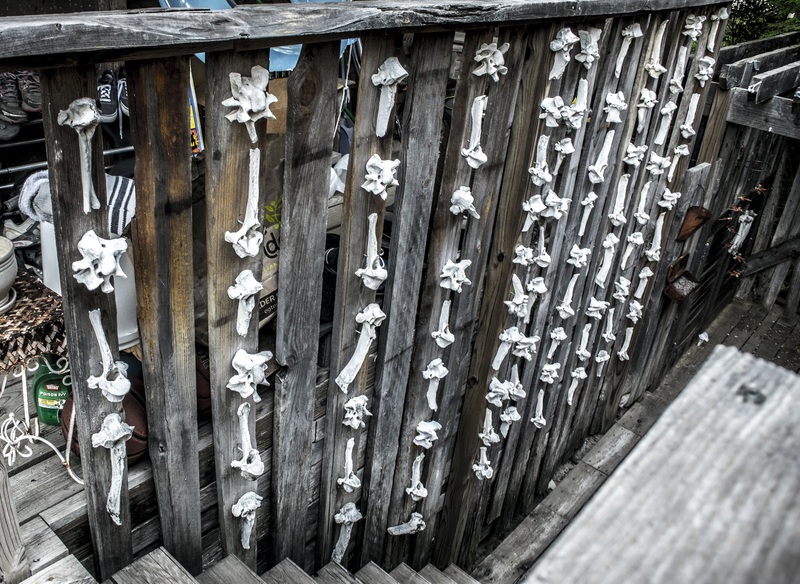 Her visit, and our final week, kicked off with a tour of Dan Phillips’ Bone Home. For many of the Ambassadors, it was our second visit to the home, but for Ambassador Kaitlyn Tyra, it was a first-time visit. Phillips began with an overview of his philosophy, his company (Phoenix Commotion), and his work. His talk is always engaging, mixing construction realities, with political preferences (e.g., recycling, sustainability), and philosophy (aesthetics). 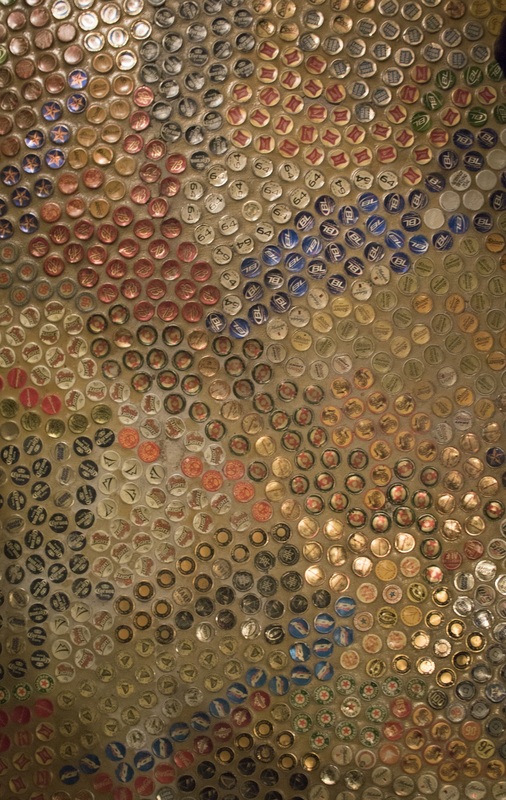 …and the bottle-cap bedroom floors. 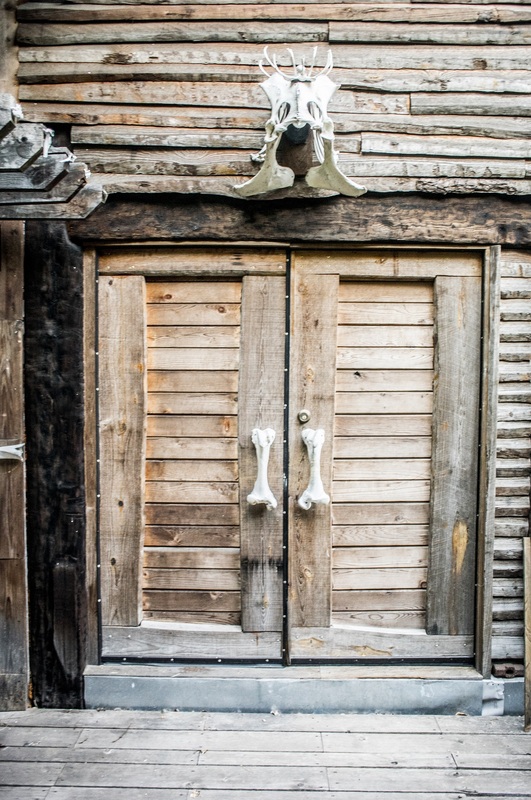 …and enter the studio through a door equipped with bone handles. 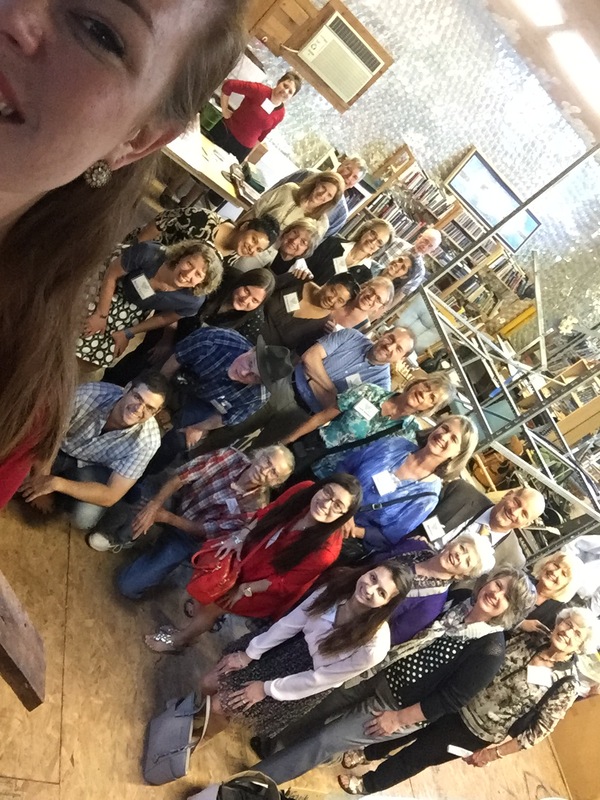 …and she may have gotten every person in the photo! 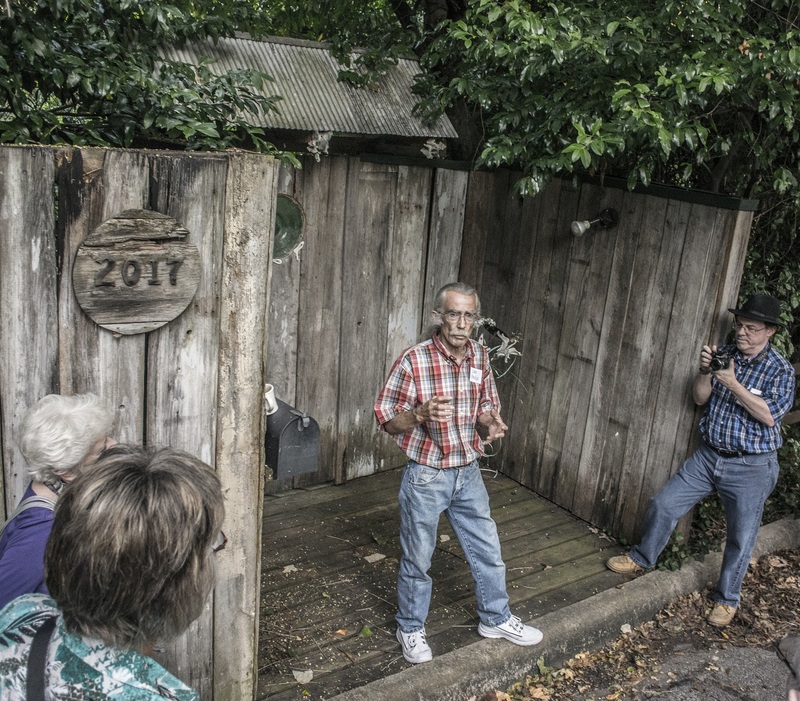 Mr. Phillips is in the front center, alongside Huntsville artist Lee Jamison, the owner of the Bone Home, George Boone, and the aforementioned Anina Moore. Following the Bone Home tour, we made our way to the Kellogg-Pritchett House, where Mary Laura Gibbs offered a wonderful tour. The foyer, Victorian parlor, and Gazebo room were the highlights, although the top-secret attic is always a treat. Adding to the pleasantness and education of the evening was the presence of Lee Jamison, who did much of the artwork in the “KP” house. In particular, he did Gazebo room, which is painted in mural fashion as though it were an actual gazebo, replete with sky-views, vine-covered lattice, and the obligatory animals (e.g., hummingbird) attracted to foliage. 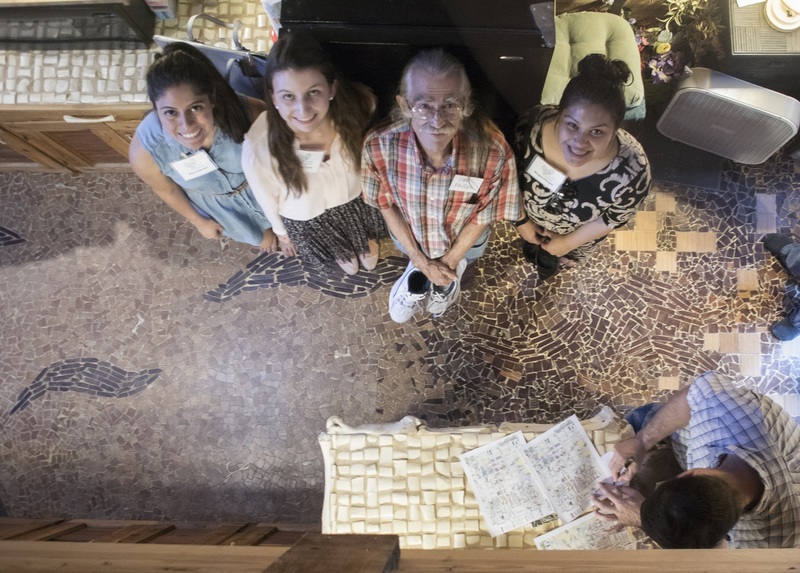 The artwork also gave participants a chance to search for these animals, including the Texas-themed butterfly, seven-legged spider (said, Lee Jamison: “I’m an artist not a mathematician!”), and red, white, and blue snake. And Constance enjoyed the photographic possibilities of the parlor. 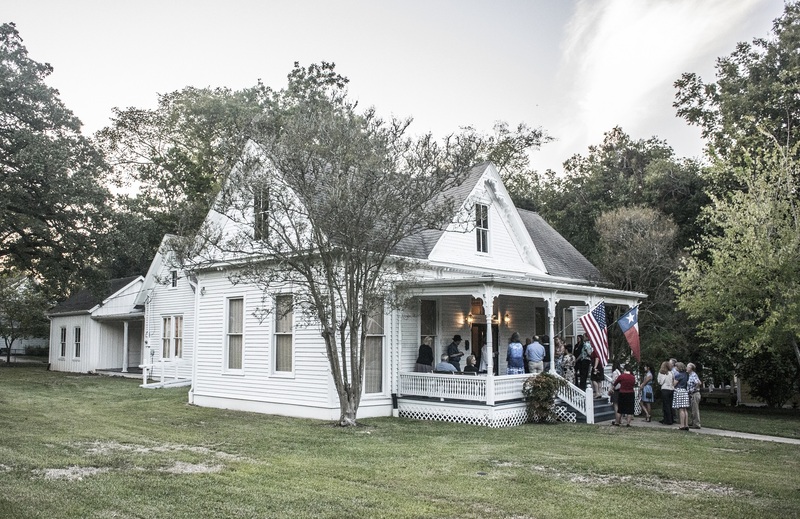 As SHSU students, it was also helpful to learn about “Professor Joe Pritchett,” who owned the home, and who was the Dean of Students for more than three decades. Interestingly, he rode his horse to school until the 1930s. 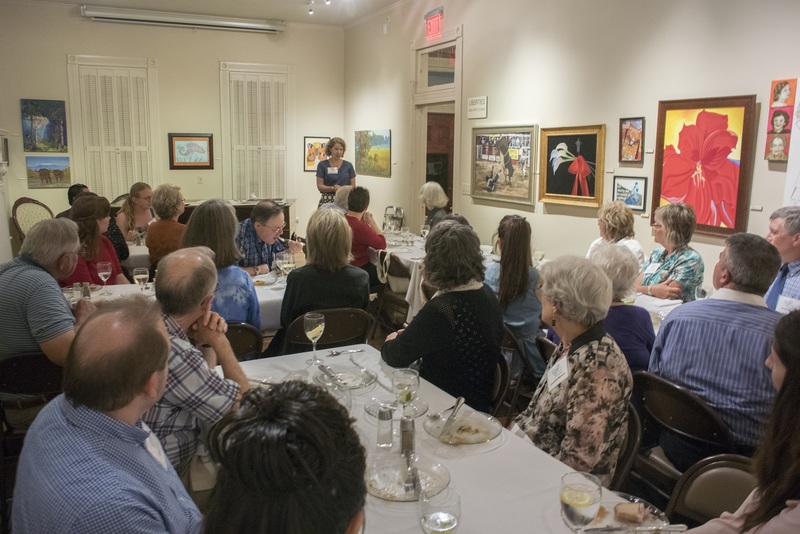 …we headed to the Wynne Home, where we enjoyed their community art exhibit and heard from Ms. Moore about the work of the Texas Commission on the Arts. 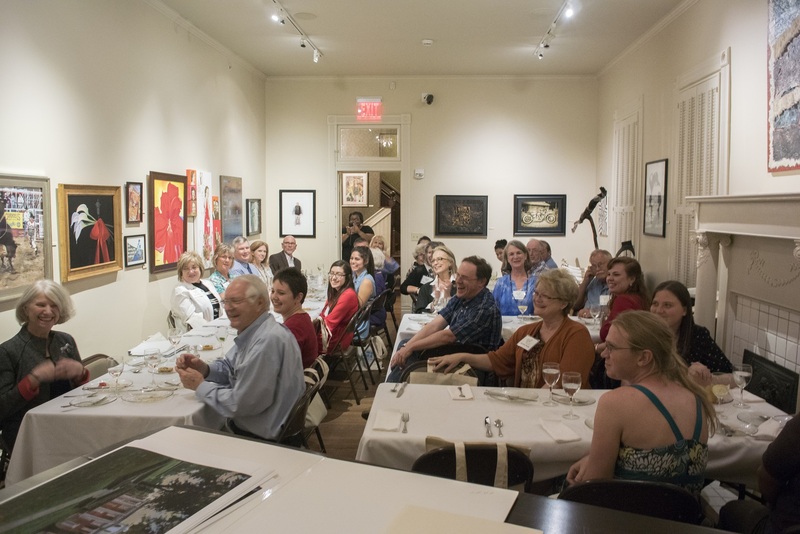 The heART of Huntsville program brought many wonderful people together, and it was an amazing opportunity to learn more about art, artistic venues, local artists, and the community in general. The heART of Huntsville will be offered again next year in September and October.